Dolores A. Jurinak was born March 28, 1926 in Chicago to Charles and Eleanor (nee Krause) Vogt. 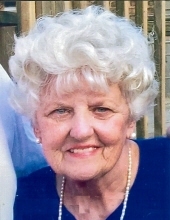 She died March 20, 2019 at Avantara of Long Grove. She loved nature, animals, travel adventures, interior decorating, a good garage sale, going to the movies, sleepovers, Friday night family pizza, buffets, chocolate milkshakes, gardening, oil painting, baking, laughing, the color blue, singing and playing the organ, your Faith, your 2 sons, your 10 grandkids and 9 great grandkids…Grandpa must be so happy to finally be with the love of his life again. We love you so much…dance with the angels and well see you again one day. Dolores is survived by her sons James (Deborah) and Steve (Connie) Jurinak; her grandchildren Jeffrey (Crystal), Jennifer (Oscar), Cyndi (Paul), Janine (Kevin), Stacey (Daniel), Michelle (Craig), Hilary (Jeffrey), Melinda (Jacob), Scott, Kimberly (fiancé Patrick) and by her nine great grandchildren. Dolores is preceded in death by her husband Edward L. Jurinak; her sisters Lorraine (late Howard) Krock and Eleanor (late Joseph) Vinci. Visitation Friday, March 29, 2019 from 4:00 PM until 8:00 PM at the Glueckert Funeral Home, Ltd., 1520 N. Arlington Heights Road, (4 blocks south of Palatine Road) Arlington Heights and Saturday, March 30, 2019 at St. Edna Catholic Church, 2525 N. Arlington Heights Road, Arlington Heights from 9:00 AM until the time of Mass at 10:00 AM. Interment All Saints Cemetery. In lieu of flowers, memorial contributions may be given to St. Edna Catholic Church for Masses or charity of your choice. "Email Address" would like to share the life celebration of Dolores A. Jurinak. Click on the "link" to go to share a favorite memory or leave a condolence message for the family.